Under the guidance of the spirits of the 19th National Congress of CPC, China Clean Development Mechanism Fund (hereinafter referred to as “the CDM Fund”) Management Center actively carried out post-loan on-site inspection on clean development concessional loan projects of the CDM Fund (hereinafter referred to as “the CDM concessional loan”). From May 14th to 17th, the Management Center and Henan Provincial Finance Bureau, carried out post-loan on-site inspection on five projects according to management procedures of projects that granted with the CDM concessional loan. These projects are Shan County Sanjiaodi 19.8MWP Distributed Photovoltaic Power Generation Project by Henan Gantang New Energy Co., Ltd (hereinafter referred to as “Gantang New Energy”), 10,000 Mu Quality Camellia Planting Base Project by Xinyang Shiligang Forest Product Development Co., Ltd (hereinafter referred to as “Xinyang Shiligang”), Modern Forestry Ecological Garden Comprehensive Development Project by Xinyang Zhonglin Industrial Co., Ltd (hereinafter referred to as “Zhonglin Industrial”), Green Bus Construction Project by Zhumadian Public Transport Co., Ltd (hereinafter referred to as “Zhumadian Public Transport”) and Zhengzhou 3rd Ring BRT Construction Project by Henan Zhengzhou Public Transport Co., Ltd (hereinafter referred to as “Zhengzhou Public Transport”). The Management Center adopted ways of visiting the progress of on-site project construction, holding seminars with project units and checking relevant information to carefully review the basic conditions of project owners, capital arrival and utilization conditions, project construction status, financial status, operation condition and credit status of project enterprises and capital security of the CDM fund. Gantang New Energy is currently under normal operation. Construction of core power generation area, polycrystalline silicon photovoltaic modules, inverters, box-type voltage boosters, switch station installation and transmission circuits is completed and they have been put into use. The project realizes the reduction of carbon and pollutant emissions produced by fossil fuel power generation by providing photovoltaic power generation. It shows favorable environmental and social benefits. Xinyang Shiligang Project has completed and is now under normal operation. 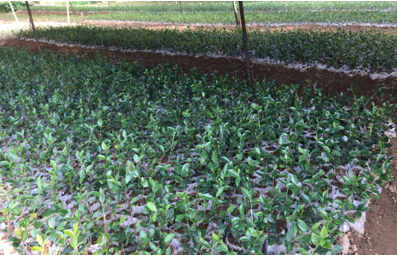 The camellia and peony planted by the project are growing in good condition. By adopting scientific and high-efficient afforestation mode and advanced forestry economy management technology to transform barren mountains, the project achieved intended targets of annual quantity of water diversion of 4.3 million ton and annual amount of soil fixation and fertilizer preservation, thus manifests significant social and environmental benefits. The afforestation, deforestation control and forest management activities conducted under this project help to restore vegetation, which can effectively reduce carbon dioxide emission, and forest fire and diseases and pest disaster, and play an important role in water and soil conservation, and wind prevention and sand fixation. The construction of Zhonglin Industrial Project has been finished and the project is now running normally. The eucommia ulmoides, pteroceltis tatarinowii and ginkgo biloba under the project are growing in good condition. The project reached expected objectives and is at status of good management and high yield. The implementation of this project is favorable to adjusting local forest categories and tree varieties, improving forest quality and regional ecological environment, thus further increases comprehensive utilization of mountains and boost social and environmental benefits. Zhumadian Public Transport Project completed relevant construction and has been put into use, and is now running in normal condition. The smart public transport system adopted by the project optimizes routes and transport capacity based on the investigation into and analysis of all local routes under operation, with focus on strengthening the transport capacity in rush hours. 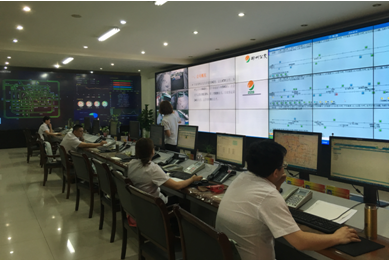 The system realizes real-time monitoring and operation, and unified organization and dispatching of buses. Switchyards, parking lots and supporting facilities can satisfy the demands by operating the project. By replacing traditional fuel buses with blade electric vehicles, the project effectively reduces vehicle consumption and exhaust gas emission, improves urban air quality, and makes transport of citizens more convenient. The project obtains good environmental and social benefits. Zhengzhou Public Transport Project completed relevant construction and has been put into use, and is now running in normal condition. Currently, 3rd ring BRT of Zhengzhou City have all been opened to traffic. By transforming transport mode, trunk routes with large busload and connection routes with high density were integrated together, which effectively elevates transport efficiency to passengers; at the mean time, the project realizes carbon emission reduction by dispatching vehicles on trunk routes through modern intelligent control management system, increasing transport effectiveness and other methods. Implementation of the project can sharply promote transport capacity of urban public transport, reduce fuel consumption and road resource utilization by vehicles, and realize reasonable utilization of urban resources and protection of ecological environment.